For the second installment of their Rachmaninoff symphonies cycle for EMI, Vasily Petrenko and his Royal Liverpool Philharmonic Orchestra cover the most popular and significant of the corpus, the Second Symphony in E minor. If anything, this release is a ready reminder of how difficult this work is by its length, complex thematic material and emotional content. Yet today’s major labels confidently invest in less than foremost ensembles to fulfill the task. And why wouldn’t they? The hype is doing the rest. Reviewers already promoted the Liverpool forces to convincing interpreters of the Russian Romantic repertory. Sure they are. Bizarre then that by comparison the Rachmaninoff from old-school Russian maestros sounds like coming from a different solar system. With Petrenko/Liverpool there is very little of the dramatic grip and even less of the soulful lyricism and sometimes savage epic imagery that a Evgeny Svetlanov or a Kirill Kondrashin conjured with Rachmaninoff’s symphonic work. 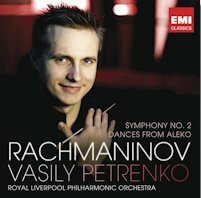 Categories: CD reviews | Tags: >Royal Liverpool Philharmonic Orchestra, Aleko, EMI Classics, Sergei Rachmaninoff, Sergei Rachmaninov, Vasily Petrenko | Permalink.